NGN’s Marketing Assistant Lindsey Dyches recently decided to cut the cord in her own home. She found the switch so beneficial that she wanted to share her experience with our readers in case anyone is curious about the process. Cutting the cord is defined as the act of switching from a traditional cable television subscription to streaming services like Netflix or Hulu. For Lindsey, it was a change that not only saved her money but also allowed her to choose exactly the channels she wanted, rather than paying more for ones she would never view. Read on for a full breakdown of her experience! Hello readers! I’m here today to tell you about my switch to streaming. A television is something that nearly every American household has grown up with in their living rooms. For many, it is synonymous with happy memories of sitting at home with family members watching the season finale of a favorite show or the rerun of a beloved movie. The fear of changing this long-standing medium is why so many people are hesitant to ‘Cut the Cord.’ Added to this are concerns of inconvenience, a sacrifice of channels, and uncertainty over whether streaming is as financially beneficial as many claim. When many of my friends began to make the change, I was hesitant about joining them. But after using a free trial with my current streaming service, I decided to make the full switch. When I did so, I found it to be an easy transition process; after a little research and a couple of phone calls, I was ready to go. To break it down for you, I cut the cord and shifted to an entirely over-the-top (OTT) television service (PlayStation Vue or PS Vue) to minimize financial waste on all the channels I was paying for but not using. So far, this has saved me an average of $50 per month, over the last six months or so, without a loss of any of my favorite channels. Moreover, I’ve found it as simple, if not more simple, than traditional cable television. Below is a comparison of the pricing and perks I am getting now through PlayStation Vue versus my old cable service. No DVR Unlimited programs stored for 28 days. Includes automatic recording settings. Unlimited with boxes for each TV 5 devices at once. Streaming equipment, smart tv, or internet enabled device required. Both services provided additional premium channels. However, PS Vue allows for even more varied options, including Hi-Yah, Cinemax, Sports packs (if you decide to go with a cheaper plan with fewer sports channels already and included) and more. Both services included all local channels. PS Vue allows you to type in your zip code and ensure which local channels are available in your area. *Note my PS Vue plan is the 3rd most expensive plan out of 4. This means it is possible for someone who needs fewer channels to save at least $15 more in PS Vue alone. **Also, note that the Roku device can stream multiple services other than PS Vue and can be beneficial for more than just television. One of the first things to do when you decide to cut the cord is to determine which streaming service is the best for your television preferences. My family used around six channels consistently; we made note of these and checked which OTT services would provide them. For many of the channels on our must-have list, multiple providers had overlapping options and pricing models. There was one channel from the group (Hallmark) that only one streaming provider offered. Its status as a must-have channel ultimately helped to influence our final decision and we settled with PlayStation Vue, as it offered Hallmark and each of the other five channels on our list plus local stations. To get the process started, we had to contact our cable TV provider, return our cable box equipment (which was done free of charge), and get our bill changed over from a bundle to only internet. Our home is older, and like many Americans, we hadn’t yet upgraded our televisions to smart TVs with streaming capabilities built-in. So, to stream on these older models, we needed to purchase a streaming stick. There are a variety of these devices on the market but we settled on the Roku stick – which we now also use for displaying photo galleries, streaming music, watching YouTube, Amazon Prime video, Netflix, Hulu, and more. 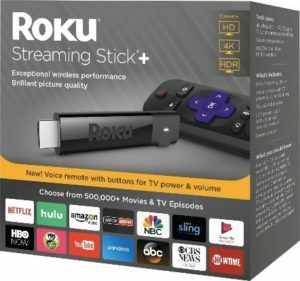 The cost for the Roku stick at the time was $60 but they go on sale often so keep an eye out. After purchasing the Roku stick, it was time to set everything up. Sticks vary, but the majority require a power connection and an HDMI or USB plugin on your television. Make sure to read the specs of each stick before buying to make sure you have the components necessary. If you have preferences about remotes with voice capability or specific hotkeys, doing your research can help you find a stick that ticks all your boxes. Ours, the Roku Streaming Stick+, came with a remote that allows us to easily switch between apps and navigate the home screen. The power and volume on this remote also connects with our television, eliminating the three or four we had been using previously. It was one of the best added bonuses of the whole experience! Once unboxed and set up, it was as easy as turning it on and signing in. After the initial sign up, the Roku remembers the login for all of our apps and we can press quick change buttons to switch between them. PlayStation Vue even allows you to set up channels as favorites, so our six must-haves are placed first the shows we consistently watch are on DVR to auto record. Within a couple of months, the Roku stick has paid for itself through the money we saved making the switch and now, we have a quicker and simpler service to enjoy. When I first began to consider the switch to OTT streaming, I wondered if it would give me the same satisfaction and ease that traditional television always had. Now, I find myself wondering why it took me so long! I’m not only saving money month over month but also enjoying a device that serves multiple purposes. As a bonus, if nothing good is on TV, I can switch to Netflix or Hulu and pick out exactly what I want to watch. Now, this is just my experience, and one of the significant perks of switching to streaming is the amount of choice you gain! Based on what you choose as your streaming service, your channels, and your streaming device, you could save even more money than me. If you are indecisive about cutting the cord, do your research and take advantage of the free trial options available to you. You’ll be glad you did. NGN and its Members are proud to be able to provide customers with the high speed connectivity and broadband capacity they need for streaming. 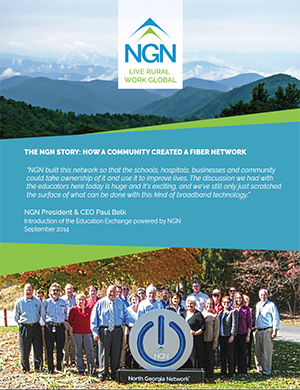 Learn more about NGN’s fiber optic network here and follow us on Facebook, Twitter, and LinkedIn for the latest news.